LG G Flex, the world's first curved smartphone from LG in the acclaimed G series of devices and LG Optimus F3Q are now available on the magenta carrier, T-Mobile. Coming with flexible display, the LG G Flex fits comfortably in your hand and follows the contour of your face, enhancing voice quality by reducing the gap between the mic and your mouth. As you probably already know, the back of the LG G Flex has a self-healing coating which is designed to help recover from the minor scratches from everyday wear and tear. The LG G Flex smartphone is already available at participating T-Mobile retail stores, select dealers, national retail stores and online. The smartphone costs $0 down with 24 equal monthly device payments of $28 with T-Mobile’s Simple Choice Plan. Plus, courtesy of LG, T-Mobile customers who purchase a new LG G Flex will receive an offer for six months of Netflix streaming service. Specs wise, the LG G Flex runs on Android 4.2.2 (Jelly Bean) OS, and it comes with a curved 6-inch OLED HD display, Quad-core 2.3 GHz Processor, a 13MP HD camera with 1080p HD Recording, 2GB RAM, 32GB ROM, 4G LTE Capable, 3,500 mAh battery, and so on. 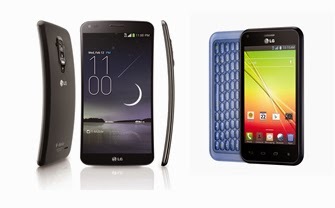 Coming with a slide out QWERTY keyboard, the LTE enabled LG Optimus F3Q ships with Android 4.1.2 (Jelly Bean), a 4 inch IPS display, a 5 megapixel camera, dual-core 1.2 GHz processor, and more. The F3Q is now available online and in select T-Mobile retail stores for $0 down and 24 monthly payments of $13 with T-Mobile’s Simple Choice Plan. 0 comments on "LG G Flex and LG Optimus F3Q lands on T-Mobile"